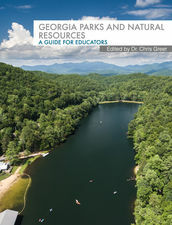 An informative e-book, Georgia Parks and Natural Resources: A Guide For Educators, by Dr. Chris Greer, is now available as a free download. Dr. Greer, a Professor of Instructional Technology at Georgia College in Milledgeville, worked closely with DNR's Office of Information Technology and Parks Division for over a year and a half to create this informative book. 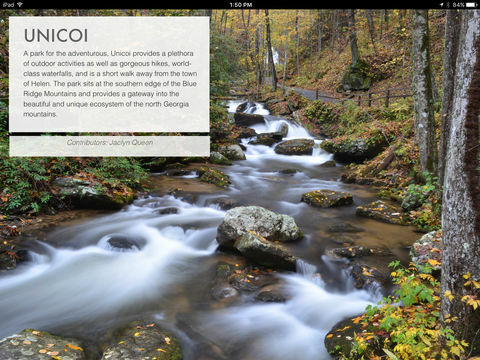 This interactive downloadable E-book book takes a look at the incredible natural resources that can be found throughout the state of Georgia. Concentrating primarily on science and history, this media-rich book takes the reader inside various parks with text, images, and videos featuring scientists and interpretive rangers. The content is an excellent supplement to material that is being covered within K-12 classrooms across the state of Georgia. Right now, the Georgia Parks and Natural Resources: A Guide For Educators e-book is available only download with iBooks on your Mac or iOS device. A version for Android and PC devices is forthcoming. Multi-touch books can be read with iBooks on your Macintosh computer or iOS device. Books with interactive features may work best on an iOS device. Staff participated as partner stakeholders for Resilient Communities and Economies as well as Healthy Ecosystems for the Georgia Sea Grant National Site Review. A National Site Review visit is conducted once every four years and is the only in-person, on-site comprehensive review of the program. Staff inspected the U.S. Army Corps of Engineers’ Jekyll Creek dredging project. This beneficial-use of sediments pilot project is the first time this portion of the Atlantic Intracoastal Waterway has been dredged since 1998. About 195,000 cubic yards of sediment are being pumped to the St. Simons Sound and 5,000 cubic yards are being pumped into the marsh using an experimental technique known as thin-layer placement. CRD staff participated on four panels of the UGA Marine Extension/Georgia Sea Grant (MAREX) site review to discuss project collaboration and opportunity. CRD’s Coastal Management section chief participated in a panel in Savannah of the first Coastal Georgia Tourism Conference. The conference was hosted by MAREX and featured tourism marketing specialists from the Georgia Department of Economic Development and National Geographic. March was highest revenue month on record for Crooked River keeping us on track to bring in over 1 million this fy19. We installed honey bees with boxes and interpretive pamphlets in new pollinator area with new observation hive exhibit for the nature center coming soon. Partnered with local bee keeper for continuing educational programming and maintenance. Richard B. Russell State Park and the lake, hosted a 200+ Skeeter Bass Boat Tournament this past weekend. This event helped contribute to an overall revenue capture of $23,000 for the park through this past weekend. SAR Reports: Sweetwater Creek- The staff and the local emergency responders assisted a stranded family (1 adult and three children) of four in a mild swift water rescue on the creek. They were no injuries to report. On April 15th, NASP Academic Archer student Landon Fuller from Loganville Middle School was chosen at random by NASP to receive an exciting prize. Landon was one of ten students selected from thousands to receive a new Genesis bow of their choice and custom Easton Academic Archer arrows. Academic Archer will reopen Sept. 1, 2019 for the 2019/2020 school year. The west central Georgia fire crew completed two burns totaling about 700 acres. Both were first entry burns that included significant old growth longleaf pine. About 300 acres were burned on the Blue Springs conservation easement; the remainder was on Sprewell Bluff WMA and two adjoining private properties. Shan Cammack and the southeast Georgia fire crew prepared 5 burn units at Reed Bingham State Park. They burned three units, including a Pitcherplant bog. The fire crew also assisted The Nature Conservancy in burning 195 acres at TNC's Broxton Rocks Preserve. On April 13th, the Go Fish Education Center hosted the Perry Rotary Club’s annual bass fishing tournament weigh-in. Approximately, 50 teams fished the tournament, fishing in any body of water in Georgia and weighing in at the Go Fish Education Center no later than 3pm. This event has been hosted at the Go Fish Education Center for the past 8 years and has grown in participation and in the number of people that come to view the weigh in. This year’s event brought around 175 people to the center to watch and the largest bass weighed was 10.3 lbs., and the winning 3 fish limit weighed just over 22 lbs. The fourth DNR Leadership Academy Course 1 was held at Charlie Elliott Wildlife Education Center from April 9-11. Nineteen students from across DNR participated in the Emergenetics workshop and heard presentations on Budget and Accounting, Grants, and Construction & Engineering. Additional presentations included Servant Leadership I and Adaptive Leadership, Focus on EPD, How to Build a Business Plan, Georgia Wildlife Federation, Servant Leadership II, and Focus on WRD. The final morning was spent in the field participating in shooting, archery, and fisheries activities. A special shout-out goes to Kim Zarneke-Williams (WRD) for all of her work developing course goals, metrics, and surveys, Jenn Pittman (WRD) for all of her support with the shooting sports modules, and Captain Stan Elrod and Chip Madren (LED and WRD) for the excellent presentations on servant leadership. HPD archaeologists hosted their third Public Archaeology Day in conjunction with State Parks and Historic Sites on April 13th. The most recent event was planned in conjunction with Clint Joiner and staff from Hardman Farm and occurred alongside other events such as Farm Animal Fun Day. The Society for Georgia Archaeology partnered as well to provide hands on activities that helped members of the public understand artifact analysis, pottery decoration, and how to identify botanical remnants in archaeological sites. An excavation unit was opened on site where families and visitors had the opportunity to learn about Georgia archaeology, screen for artifacts, and learn how to excavate. On April 9th, HPD staff presented to the Hawkinsville Historic Preservation Commission. Hawkinsville recently reactivated their Historic Preservation Commission and participates in the Certified Local Government Program. While in town, HPD staff also toured the Hawkinsville Opera House and talked to one of the Opera House’s Board Members about potential funding and educational opportunities for the preservation of historic theaters. On April 18th, HPD staff is presenting at a Lunch and Learn sponsored by the City of Clarkston. The City of Clarkston recently passed a historic preservation ordinance and is seeking members to sit on their new Historic Preservation Commission. This event will further inform Clarkston’s elected officials and interested residents about the history of the historic preservation field and how local residents can get involved with preserving Clarkston’s historic resources. Melissa Jest met with representatives from the National Rosenwald Park Campaign committee at Cusseta Industrial High School in Chattahoochee County as the reps visit Georgia Rosenwald schools this month (April). The committee is promoting the creation of a National park recognizing philanthropist Juliue Rosenwald. Melissa recommended five of Georgia’s 52 existing Rosenwald schools to the committee in December 2018-- Cusseta Industrial High School/ Chattahoochee County; Fort Valley High and Industrial School/Peach County; Noble Hill School/Bartow County; Thomas Jefferson Elder High and Industrial School/ Washington County; Vienna Rosenwald School/ Dooly. For more information about the proposed park, visit https://www.rosenwaldpark.org. On April 14th, Game Wardens from Region VI-Metter wrapped up a two-year investigation that led to the dismantlement of a four-suspect poaching ring. The group had poached a variety of game animals across Screven and Effingham counties. The investigation led to a total of 78 charges against the four suspects. Charges included hunting deer at night, hunting from a motor vehicle, hunting big game from a public road, hunting out of season, hunting without permission, hunting without a license, taking over the bag limit of antlered bucks and hunting after obtaining the bag limit. Seven racks and two turkey gobblers were also seized as evidence. On April 12th, Region IV-Macon Game Wardens responded to a hunting incident in Spalding County where a male subject was shooting at geese on a lake and hit a boater on the lake. The shooter was arrested for reckless conduct. The victim was treated at the hospital for minor injuries. The incident is still under investigation. On April 11th, Game Wardens from Region VI-Metter, along with Lanier County EMA, responded to a vessel in distress call on the Alapaha River in Lanier County. The vessel and the 84-year-old male boater were located approximately 1½ miles downstream of Highway 122. The vessel, a non-motorized 14-foot fiberglass boat, had taken on water. The Game Wardens towed the vessel and occupant back to the Highway 122 landing and assisted the man with trailering the vessel.